When Adobe updated Photoshop to CS5 in 2010, a plethora of books, DVD’s, free web tutorials, and online video lessons became available to help users achieve quick proficiency with the application. 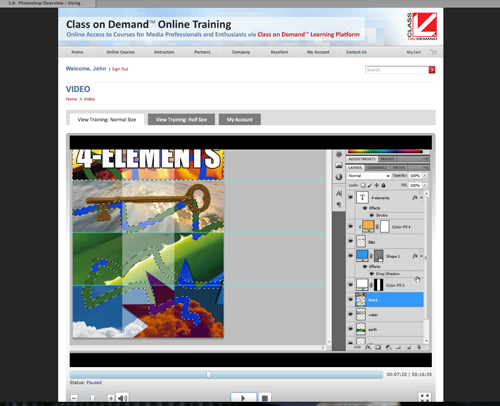 One of the companies that offer online video tutorials is Class On Demand. Class On Demand is an Illinois-based publisher that specializes in online and video training for a variety of media and software. 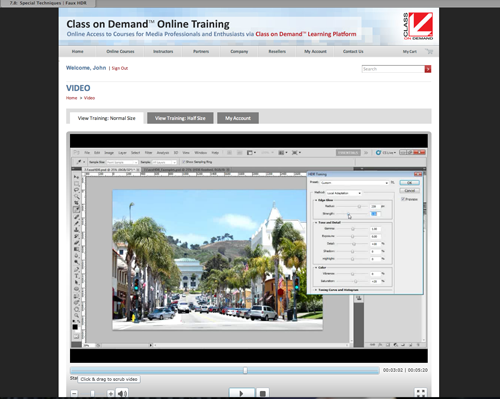 Class On Demand Complete Training for Adobe Photoshop CS5 is offered as an online class or a DVD. I used the online class rather than the DVD for this review. When the training is purchased via Class On Demand’s website, you are able to login to the training as often as you like with a username and password. The On Demand training has an expiration date of two years from the date of purchase. The training is taught by the very capable Sue Jenkins, a Certified Adobe Expert and Instructor. Ms. Jenkins is a photographer plus web and graphic designer. She is the owner and creative director of Lucky Chair, a web and graphic design studio. Although the training is for the beginning Photoshop student, there is room for improvement. This is not a very polished production for the high price tag. Initially you have to download Microsoft’s Silverlight to stream the online videos. Microsoft Silverlight is a free plugin that works with all OS and web browsers. I downloaded and installed the latest version on my iMac but the videos continually refused to advance sequentially. This was very annoying. After each chapter the following message appeared “We’re sorry, there’s been a problem connecting to the media. Please try starting this again from the menu or try to view it again at a later time.” (see screenshot.) That meant scrolling down the screen, locating the viewed chapter, and clicking on the next chapter to be viewed. The excellent video2brain production, Learn By Video Adobe Photoshop CS5, a review I did here, supports a Watch and Work mode. In this mode you can work on the examples in Flash while watching the video in a separate window. 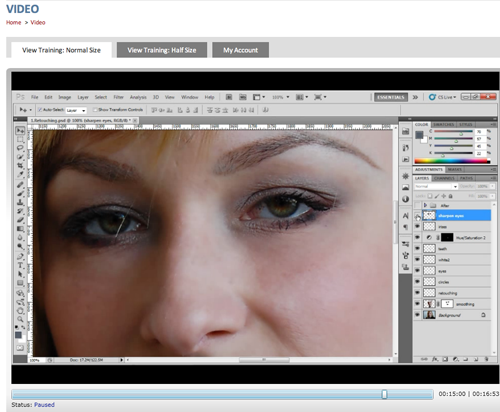 This is an excellent feature to learn the simple and more complex features of Photoshop. There is not a component in this training to work on examples along with Ms. Jenkins. 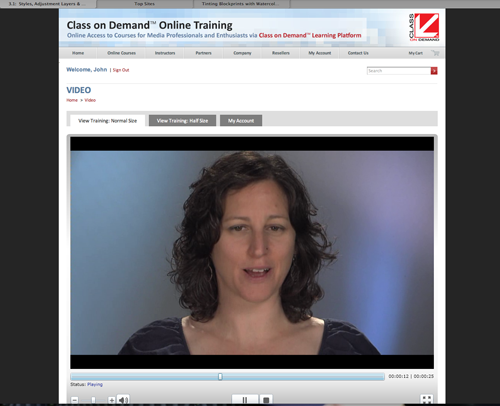 Class on Demand online training has two screen modes: half screen and normal screen. There is a small full screen icon located at the right bottom section of the screen. I viewed the online class in normal screen mode as I found the quality and resolution of full screen mode was diminished on my iMac’s 27-inch monitor. Included in the online training is a folder of downloadable project images. Class On Demand Complete Training for Adobe Photoshop CS5 is seven hours in length and divided into modules. The training consists of seven modules: Photoshop Overview, Photoshop Tools, Styles, Layer Masks and Layer Adjustments, Web Graphics, Retouching Techniques, Editorial Techniques, and Special Techniques. The modules range from two and a half to thirty-one minutes in length. Sue Jenkins is a confident and very knowledgeable instructor. Her voice is well-modulated and her enthusiasm for teaching and Photoshop CS5 is obvious. However, where was the videographer or editor when they allowed her to introduce each module by reading off a prompter with eyes downcast? I found it irritating that no one moved the prompter to eye level or instructed her to move her eyes up and look into the camera to make eye contact with the viewer. Poor editing makes this training appear unsophisticated and low budget. Her tutorials are well explained but I found some of her examples and sample images to be amateurish and distracting. For instance, when she explains layer masks she illustrates the mask by drawing squiggle lines. Why not show how to enhance an image or design by masking with an adjustment? I think real world examples are preferable when learning new software. The Retouching lesson module disappointed me. The skin retouching she performed on the model looked no different from the before and after photograph. Skin retouching should remove blemishes, and then a light application of softening to naturally enhance the skin is the final touch. There are faster methods to enhance eyes and whiten teeth. I noticed when she lassoed around the model’s eyes and used sharpening, the skin around the eye was oversharpened. Retouching should be subtle and such an apparent disparity between skin textures is poor technique. I do think this may have been unintentional as Ms. Jenkins’ mentions several times in the training she has time considerations. For viewers unhappy with Ms. Jenkins’ retouching techniques, I recommend the retouching techniques offered by video2brain’s Learn by Video Adobe Photoshop CS5 or Scott Kelby’s book The Adobe Photoshop CS5 Book for Digital Photographers. The Special Technique module also includes a Faux HDR (High Dynamic Range) technique. HDR techniques can be easily overdone and look not surreal but grossly artificial. HDR is a valuable tool for complicated lighting situations such as interiors or dusk, when the sky is bright but foreground lighting is dark. Ms. Jenkins uses an image of a bright sunny day when an exposure adjustment would be more appropriate than HDR. The final result is garish and I think using a photograph that could illustrate the technique elegantly would have been more effective to the beginning Photoshop user. The aforementioned Learn By Video Adobe Photoshop CS5 also offers a folder of lesson tutorials for mobile phones as well as the iPhone and iPod. I find the ability to view lessons on the fly a fabulous inclusion as I am never far from my iPhone. Class On Demand does not offer mobile device support with the online training. On Demand video is an attractive option for busy individuals or visual learners to acquire knowledge of Adobe Photoshop CS5. Although I consider myself a visual learner, video2brain’s Learn By Video Adobe Photoshop CS5 included a booklet highlighting the application’s latest features and a keyboard shortcut glossary. I think it would be helpful if Class On Demand offered a downloadable PDF with the same information. For the considerable price of the Class On Demand Complete Training for Adobe Photoshop CS5 the video should stream well without hiccups or lapses and move seamlessly to the next lesson. The example images and lessons should be tailored so the confident beginner can have an imaginative glimpse into the dynamic possibilities of Photoshop. A better value may be the DVD rather than the two-year On Demand training. It appears that Class On Demand wanted to keep the training within a seven-hour time constraint. Some of the tutorials appear perfunctory and end abruptly. 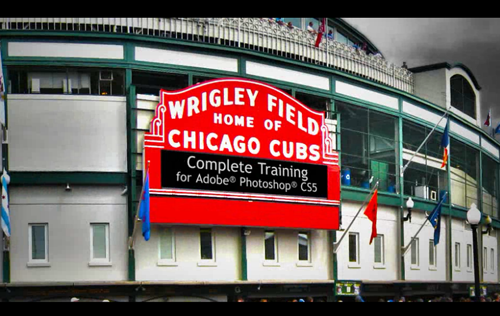 This production is well intended for the Photoshop CS5 beginning student but there are less expensive and more comprehensive options available.